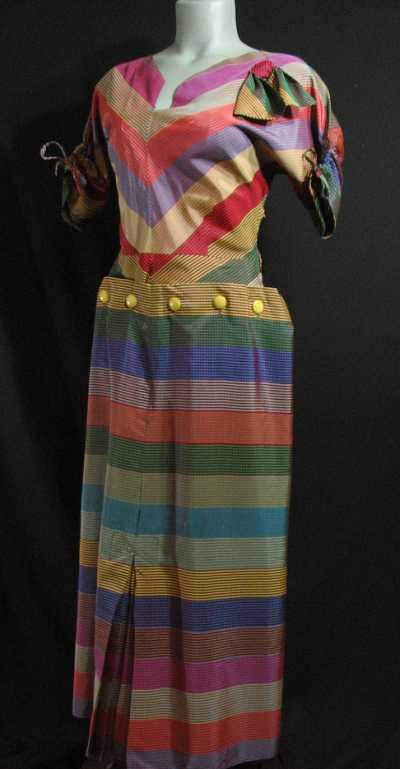 This is from Heavens To Betsy Vintage, who has a lot of really, really, lovely and fairly rare patterns at prices to match. This one caught my eye, although I'm not sure I would buy and/or make it. Well, okay, I'm sure I would buy it given the right circumstances, and I'd probably make it, given a moment (or five hours or so) of weakness, but I'm not sure I would wear it. 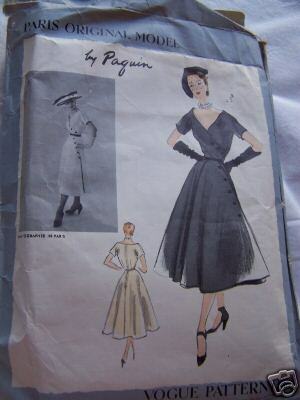 See how the women in the illustrations have their arms akimbo to show off the sleeviness of the dress? I'd feel compelled to stand like that THE WHOLE TIME I was wearing it, and that would make it hard to do all the things I normally do in a day, like type and drive and read and skip to the next song on my iPod. I think seeing me with my arms like that would also make everyone around me worried that I was about to bust out with their full names as a prelude to a scolding. Also, see how the faces on the illustrations are dialed up to "manic cheerfulness," and how just plain scary that is combined with that body posture? My face is usually on the same setting so I'd look like that too — as if I were about to tell you that you need to submit to our new alien overlords AND I made your favorite chocolate pudding for dessert, and isn't that swell? 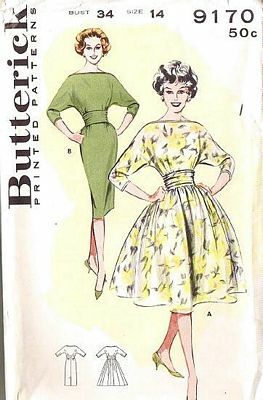 If you'd like a dress that made you look about to deliver a diatribe and/or message from Superior Beings at any particular moment, click on the image to purchase the pattern. This may come as a shock to some of you, but I'm not a big person for musicals — for theater in general, actually. I enjoy it when I am put in the way of seeing any, but my first impulse when seeking entertainment is to reach for a book, and my second is to reach for a long, arc-y, plotty TV show (like The Wire — the hotness of Dominic West will go a long way towards warming up January here in Chicago), and my third is to watch national icons blow up in spectacular and original ways while eating popcorn. So: not so much with the musicals. 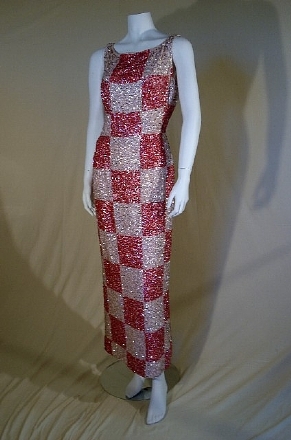 But now I think that it would be hilarious to wear something like this to an opening night for Chess, wouldn't it? Sure, I'd be flamboyantly overdressed, but I would have made an effort. A $650, lose-ten-pounds-first kind of effort, but it would probably be worth it. If it's worth it to you, this is up at Shrimpton Couture. I'm not sure exactly how to navigate to it, sadly. The site doesn't have individual linkable pages for each dress. But you probably won't mind browsing around, as there's a lot of other eye candy there, too, and the pictures are good! Has anyone seen this pattern? I mean, for sale, out in the wild? Mary P. was outbid — sniped, really — by just a smidgen when this was up for auction last week and she's been mourning it ever since. Leave a comment or drop an email if you have one you're willing to sell/trade. I know it's hard to tell from the picture — and while we're here, can I just rant about sellers who show teeny-tiny pictures of patterns? A hint: if you can hold the actual object up to the computer screen, you can run the photo of it FULL SIZE, people — but it looks amazing. I'd love for Mary P. to find a copy so she can make it and send me the picture. And in a fit of selflessness (because now you're all going to outbid me!) may I remind everyone again about eBay's Favorite Search feature? When a search comes up empty, save it, and then eBay will email you when your holy grail shows up again. At the very least, getting a dozen emails from eBay every day will test your desire for whatever the item is — I've canceled more than a few saved searches when I realized that my annoyance at dealing with the email was more than my desire for the item. (You can also get eBay searches through RSS, but I haven't done that yet. Probably should!) Saved searches are most useful when you save a very detailed search — looking for a pair of shoes or a pattern in a particular size, fabric in a particular color — so that you don't waste time looking at pages of stuff that's not quite right. In fact, I think being able to do Boolean or regex searching is an indispensable skill in the post-eBay, post-Google age. I might just have to go volunteer to teach a couple how-to-search sessions at my son's school … although probably not using eBay as an example! I really like the Boden catalog, despite not ever really wearing anything from it (except for one floral coat that has got to be my favorite jacket ever and which goes with everything). This dress looks so comfy that I almost forgive it for not having any pockets. And for having angora in it, which always makes me itch. And for being $118, because I know the blue and browny.jpgnk versions (click on the image to visit the catalog page and see them) will probably go for less in the sale. 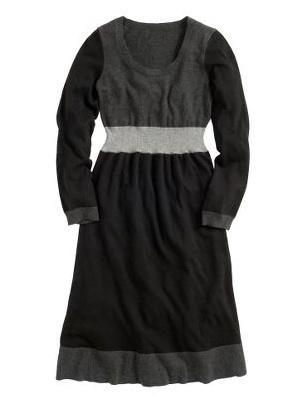 I can't remember the last knit dress I had and wore — I think I had a very severe early-90s JCrew black knit wedge dress that made me look like as if I were the head girl in a Dickensian boarding school dressing up as the headmistress. (What can I say? It was a favorite look at the time.) All I needed was a lorgnette and a set of chatelaine-type keys (and a fondness for gin) and it would have been perfect. I think I even wore it with a wonderful pair of kiltie brogues that I wish I still owned. I wore them into slivers of leather, I did. I'm not sure what I did with that dress — it might have been sent away in the great postnatal clothes purge (otherwise known as "If I Can't Breastfeed In It, It Is Dead To Me" diaspora) of the year 2000; then again, it might be in a plastic storage tub in the attic. You never know. I think if I had this dress I would want to wear it with bright tights (yellow? pink? red?) but that I would always end up taking one last look at myself in the mirror and going back upstairs to change into black ones. I'm also not sure what coat I'd wear with it — knit dresses tend to get so bunchy under coats, and you never can be absolutely sure, even with a good slip, that static cling hasn't decided to start wrapping the dress higher and higher up your legs. Now I have a yen to hear all sorts of knit dress stories. Leave 'em in the comments? So I ran into the amazing India last week (actually, she was nice enough to come out to an event at the NYPL to see me!) and she was carrying The Perfect Bag. We were chatting away and then BOOM! There was the bag. Seriously, I think I interrupted her mid-thought to ask her where she got her bag. "It was from Daffy's," said India, and instantly my heart beat faster — a gorgeous bag, and one that was guaranteed not to cost $350! India quickly showed me all the pockets — so many lovely pockets — and the pink lining, and let me fondle the leather. I had to have one. But, sadly, I didn't have much more time in the city! Certainly not enough time to go to every Daffy's … What to do? What we always, do (Pinky …) go to the Internet! In this case, the Sierra Trading Company, who had it in stock (Sierra is slightly more pricey than Daffy's, but it was still, barely, <$100, which is my LIMIT for handbags, even perfect ones). Why is this bag perfect, you might ask? Well: it's green, which goes with green (duh), brown, black, orange, and gray, which are the colors of all my fall & winter coats. It has a cross-body strap. It is big enough (11-x16-x4-”) to hold my MacBook in its neoprene sleeve, without being so big that the laptop wobbles around. And did I mention the pockets? Four on the front (two zip, two open), one inside, and one zippered long pocket on the back. Plus pen loops! It is not dripping with fobs or other dangly useless metallic bits. It is completely free of giant logos. In short: genius. 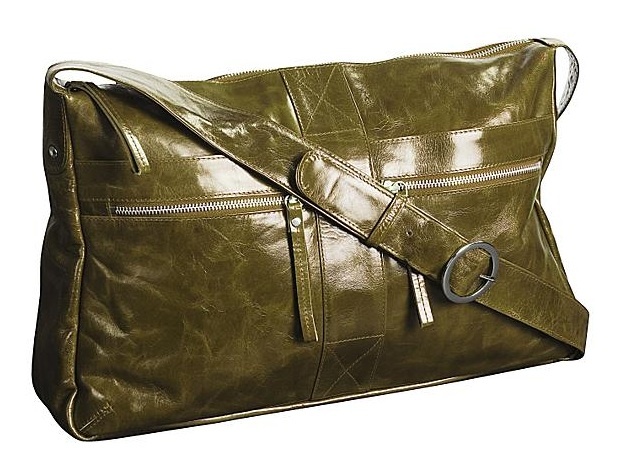 Why it's showing up in the clearance racks of the world is a puzzle — who *wouldn't* want this bag, even at its original (gulp) price of $186? Thinking about Prom, or Holiday? This listing ends today, I think, so jump if you want it. Click on the image to visit the eBay auction.